Hunter Orchards in Siskiyou only deliver their stiff neck garlic to the San Francisco Ferry Building Farmers' Market for a few weeks every year. They told me that tomorrow would be their last trip with this hard-to-source-in-California stiff neck garlic that will keep well in your cool pantry until Valentine's Day 2010. This could be your last chance to stock up. 2007 | Served on a pretty nasty plate. The is really well done! 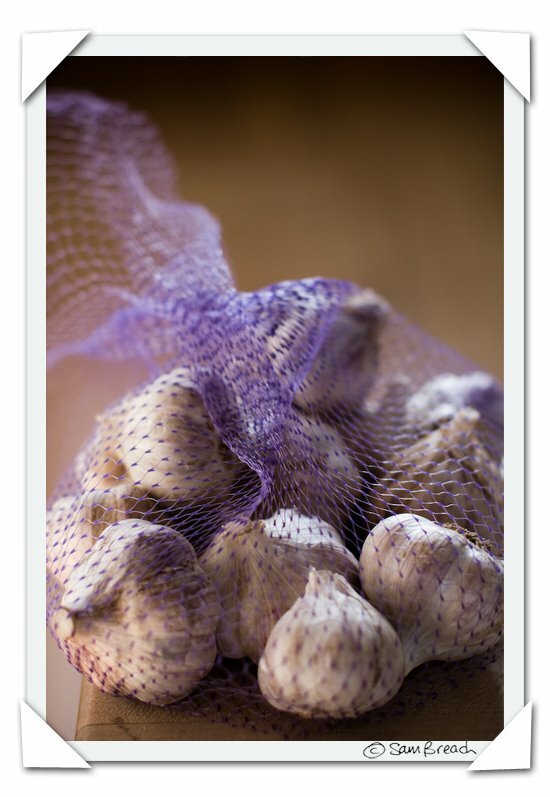 The lavender in the netting with the white of the garlic really go well together. The focus is lovely as well. Very nice! Hope you make it to the market in time to get your supply, it looks lovely. Will you photograph my wedding? I know exactly what I'm going to wear for a veil. How was yours? I was all excited after falling in love with it last year, but the bag I bought yesterday was all rotten :(. I can't believe it would last that long. Erin - I am so sorry to hear that - mine has all been great so far. I bought one bag and one braid. That stuff isn't cheap - maybe you can ask to get a refund? Turns out the co-op farmers my family shops at in Washington will be growing stiff-necked garlic in the Skagit valley -- I'll suggest they send a few batches down to California when it's ready! Damn, I missed them this year. Was looking for them too. Really disappointed, they weren't in the same place they were last year, and I just did not see them. I bought enough last year to last me until green garlic came out again, and it worked like a charm. Comfortably until Valentine's day, even a bit longer. This is common with garlic in Italy; store it in a good dry space (anywhere in SF basically) and it will keep for a long time.